If you’re a golfer, add Cypress Lakes to your list of 55 plus communities to consider when planning your retirement life. Located in beautiful, sunny Central Florida, we offer resort-style living that is affordable, accessible, and enjoyable each and every day. And at the center of it all are our two professionally designed golf courses, complete with a fully stocked pro shop and a PGA pro on staff. Whether you’re an occasional duffer or a seasoned golf enthusiast, you’ll find our courses both challenging and enjoyable. The North Executive is an 18-hole par-60 course designed by renowned golf course architect Lewis “Chip” Powell. Our South Championship is longer and more challenging, offering more than 6,600 yards over 18 holes that will test your skills and strategies. Plus, we have a staff that features a full-time activities director and a personal trainer, both of whom will ensure that your active time at Cypress Lakes is both enjoyable and safe. For our golfers, we also have a PGA pro on staff, who offers lessons for individuals and groups. With an average temperature of 74 degrees, and 300 days of sunshine every year, you will never again need to shovel, or bundle up to fight frigid winter temperatures. 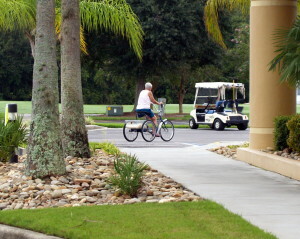 Every day will be a vacation when you choose Cypress Lakes as your Central FL retirement community. For more information on how we compare to other 55 plus communities, contact us today.